How I wish I have a Type A personality. If you’ve been surfing in the personal development/motivation part of the internet, you would have heard these terms thrown about quite often. I first heard the term from Chase Jarvis who self-describe himself as having a type A personality. Other people to join this rank are Gary Vaynerchuk, Tim Ferris, Casey Neistat, Elon Musk and many other great entrepreneurs and creators. 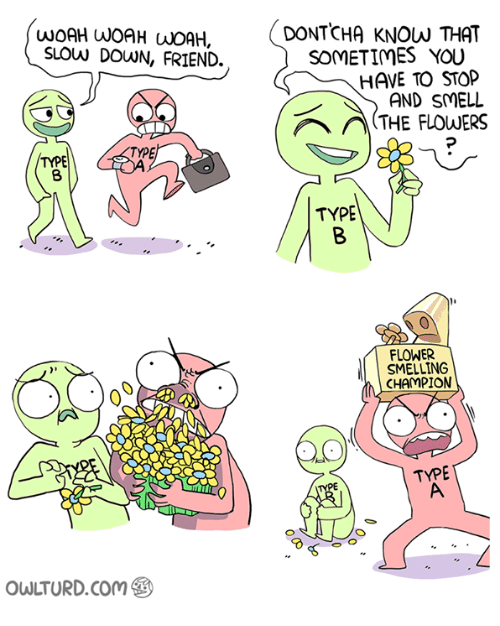 Before we continue this discussion, let us define what are considered type A or type B personalities. Type A personality: Competitive, Impatient, Aggressive, Fast-talking. Type B personality: Relaxed, Non-Competitive, Express Emotions, More Reflective. In general, people with type A personality are always on the ball. They experience a constant sense of urgency. However, they also short-change themselves by not being able to sit down and relax and enjoy the moment. In the words of Gary Vaynerchuk, they “suffocate” when they are not doing work because that is their “oxygen”. They are never satisfied with the status quo. However, Type A personalities can sometimes be hostile. They “tend to be easily aroused to anger or hostility”. This might be a minor drawback to having this personality. Even though that might be a drawback, I still believe that the competitiveness and time urgency characteristics of people with Type A personalities allow them to thrive in the working world and achieve the successes that they want. I mean, overall, it really comes down to what you really want to achieve in life. To me, I really want to be the best that I can be, to constantly improve myself. Therefore, a type A personality would be helpful for me to achieve that goal. So, which type of personality do you have?